Thank you for your interest in 3200 Series HD Belt Conveyor. We will be happy to discuss the pricing in more detail with you please fill in your details below and somebody will contcat you back with a quote. 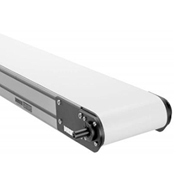 Alternatively please call us on 01772 690656 and please reference our part number - 3200 Series HD Belt Conveyor. • iDrive models now available! • Knife edge rollers optional from 25mm dia. • Widths up to 1,219mm • Wider widths available, please enquire • V-guided and non V-guided belts • Lengths up to 30,175mm • 76mm diameter head and tail pulleys • Nosebar tail end available • Heavy duty belt conveyors handling loads up to 455 kg • Sealed Bearings • CE Models Available • Flat Belt End Drive, Cleated Belt End Drive, Centre Drive, and iDrive® models. • Widths up to 1,219mm (Wider widths available, consult factory). • V-guided belt tracking. • Lengths from 762mm to 30M depending on drive selection. • Speeds up to 182 m/min possible. • Capable of handling loads up to 455 kg. • 76mm diameter drive pulley as standard. • Knife edge rollers optional from 25mm dia.